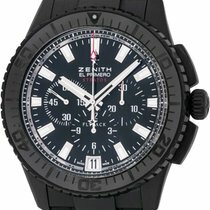 Stainless Steel, black rubber strap with deployant clasp, unidirectional rotating diver bezel, black dial, automatic (Cal. 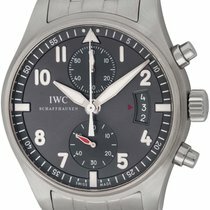 405B), 12-hour chronograph with flyback reset, display back, Ref. 03.2060.405/21.R515, Zenith warranty dated March 2016, 46mm, Retail = $8,500, Like New in Box with Papers.